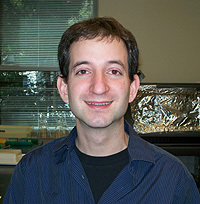 Seth Rubin is the third UCSC faculty member named a Pew Scholar in the Biomedical Sciences. The Pew Charitable Trusts has named Seth Rubin, assistant professor of chemistry and biochemistry at the University of California, Santa Cruz, a Pew Scholar in the Biomedical Sciences. Rubin will receive a $240,000 award over four years to support his research on the molecular mechanisms involved in the development of cancer. Rubin is among 20 exceptional researchers chosen this year and the third UCSC faculty member to recieve this prestigious award. Previous UCSC recipients are Doug Kellogg, professor and chair of molecular, cell, and developmental (MCD) biology, and Hinrich Boeger, assistant professor of MCD biology, who won the award last year. "The impressive number of UCSC faculty selected as Pew Scholars speaks to both the high quality of our faculty and the value of our uniquely interdisciplinary approach to basic science that advances human health," said Stephen Thorsett, dean of physical and biological sciences. Rubin studies the molecular processes that control cell division and how those processes go awry in cancer cells. In particular, he studies the control mechanism involving the retinoblastoma protein, which in normal cells serves as a molecular "gate" that keeps cells from proliferating until they receive the proper signals. Understanding how these control mechanisms work requires a detailed molecular picture of the interactions between proteins and how those interactions are affected by modifications of protein structures. For example, the addition of a phosphate group (phosphorylation) controls the activity of the retinoblastoma protein, opening the gate and allowing cell division to proceed. "The opening of the gate by phosphorylation is highly upregulated in many cancers," Rubin said. "The retinoblastoma protein is named for the rare childhood eye tumor in which its gene was originally found mutated. Now the same protein is thought to be involved in a diverse set of tumors." Rubin's lab uses powerful techniques such as x-ray crystallography and nuclear magnetic resonance to determine the structures of protein complexes and to learn in molecular detail how structural changes and chemical modifications affect the biological functions of the proteins. Ultimately, this information may be used by pharmaceutical companies to design better drugs for fighting cancer. The Pew Scholars selection process is rigorously competitive, as all applicants are highly talented researchers in their fields. Applicants must be nominated by an invited institution and must demonstrate excellence and innovation in their research. This year, 149 institutions were invited to nominate a candidate in basic biomedical research, and 117 eligible nominations were received. The scholars are selected by a distinguished national advisory committee, chaired by Torsten Wiesel, president emeritus of Rockefeller University and a 1981 Nobel laureate. More information about the Pew Scholars in the Biomedical Sciences Program is available on the program web site. Note to reporters: You may contact Rubin at (831) 459-1921 or srubin@chemistry.ucsc.edu.